If you’re ill or injured and unable to work, you may have considered filing a disability claim. If you’re covered by an employer-provided disability insurance policy, chances are it’s governed by ERISA, the Employment Retirement Investment Security Act. ERISA is a 1974 law created to protect participants in retirement, health, and disability plans. With respect to disability plans, ERISA protects employees by setting forth the rules, procedures, and timelines under which plan providers must determine participants’ eligibility for benefits. Many people think that making a disability claim isn’t a big deal and is something they can handle on their own. In some cases that may be true, however there are some compelling reasons to consider hiring an attorney to assist you with the ERISA claims process: (1) ERISA procedures can be difficult to navigate; (2) you only have one chance to prove your case on appeal; (3) you just don’t know what questions to ask; and (4) your attorney can deal with the insurance company. First, an ERISA disability claim can easily be denied or forfeited if all of the procedures and evidentiary requirements of your plan – and the regulations governing ERISA – aren’t met. In many cases, you need to provide notice to your employer before filing a claim. Moreover, determining your date of disability and the last date you’re able to work, will have an effect on all of the time limits for your ERISA claim and any appeals. Before you file a claim, you should also ensure that you’ve reviewed your disability plan language to determine the definition of “disability,” benefit limitations, the rate of compensation, and any time limits before benefits kick in. Finally, you will want to ensure that you’ve gathered ample medical evidence of your disability before you stop working and before you file a claim. You should also review your medical records and ensure that they record objective medical evidence of your disability. Once you determine the date that your disability began, you have a time limit under your plan to file a claim. And once you provide notice to your employer and file a claim, you will have time limits to respond to the plan provider if they ask for more information. If they deny your initial claim, you will again have a limited amount of time to file an appeal. All of these procedural limitations and legal policy interpretations can be difficult to navigate without an attorney. An experienced ERISA disability attorney can ensure that your disability is well documented and help you understand your plan coverage and benefits long before you file your initial claim, helping to ensure that your request for benefits is successful. If your plan administrator denies your initial disability claim, you should review your denial letter, and the stated reason for the denial, very closely. This reason will determine how you should proceed and what additional information and documentation you should offer in an appeal. You will only have 180 days from the date of the claim denial to file your appeal. Moreover, this is the last chance you will have to provide additional medical information and documentation. Hiring an attorney after a denial of a disability claim is an excellent way to ensure that the administrative record, and the evidence of your disability, are as strong as possible. If your appeal is denied, you do have the right to file an ERISA lawsuit in federal court. However, this lawsuit will be essentially treated as an administrative law hearing. The judge will look solely at the administrative record and the evidence and documentation presented initial claim and in the appeals process. There is no opportunity to present additional evidence at the federal court level. No one will testify on your behalf on the stand. So, ensuring that you have the strongest possible case before you appeal, is essential to a successful claim. A skilled ERISA attorney can help you with that. Your plan administrator is at an advantage at every step of the claims and appeals process. You don’t know what you don’t know. But the plan administrator knows the policy language. They know what pieces are missing from your claim. But your insurance provider is unlikely to hold your hand and guide you through the process, showing you the holes in your medical documentation and how to fill them. But a skilled ERISA disability attorney can do exactly that for you. Your attorney will know the questions to ask and what the answers actually mean for you and your claim. If you’ve been attempting to negotiate with your disability plan administrator, sending additional information and diligently following up, but you still feel like the provider isn’t working with you in good faith, an attorney can help quickly cut through the bureaucratic mess. If you quickly hire a qualified ERISA attorney after a claim denial, your attorney can tell you what your insurance company won’t and help ensure that your appeal provides all of the necessary medical documentation of your disability. After all, your appeal is your only opportunity to prove your case. Don’t squander this last chance by trying to do it alone. 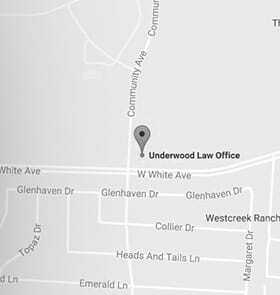 The Underwood Law Office in McKinney, Texas law firm serves all of Dallas and Fort Worth, including Plano, Frisco, Allen and McKinney. Our Huntington, West Virginia attorney office serves all of West Virginia. If you’re considering filing an ERISA disability claim, or if you suspect you’ve been wrongly denied disability benefits under ERISA, please call our toll-free number 844.UNDERWOOD (844.863.3796) or send us an email to arrange your free consultation with our lawyers. Se habla español.